DELAYED PAYMENTS from the Indian Air Force has landed the once debt-free Hindustan Aeronautics Ltd in a spot. By the end of this year, HAL’s dues will balloon to Rs20,000 crore, crippling its ability to carry out day-to-day operations. Its financial woes have given ammunition to the opposition, which had been targeting the Narendra Modi government for having bypassed the public-sector company to award offsets related to the Rafale deal to Anil Ambani’s Reliance. “The financial situation at HAL would have been different if the Rafale offsets were given to it. It is a huge contract,” T. Suvarna Raju, former chairman and managing director of HAL, told THE WEEK. Insiders say HAL, which has paid Rs5,000 crore to the defence ministry in dividends in the past four years, had to borrow around Rs1,000 crore recently to pay salaries to its 30,000 employees. The crisis at HAL has intensified the war of words between Defence Minister Nirmala Sitharaman and Congress president Rahul Gandhi. Rahul alleged in Parliament that the government had favoured Reliance at HAL’s expense. Sitharaman retorted that the government had given HAL contracts worth Rs1 lakh crore, and that the Congress was weeping crocodile tears. While the government may yet contain the Rafale fallout, the HAL issue could become the next political hot button. Sitharaman recently called HAL chairman R. Madhavan to Delhi to discuss the issues plaguing the company. Madhavan apparently told her about the workload status at each of HAL’s nine units across India. According to sources, the production line at the Sukhoi complex in Nashik will be inactive once it delivers the pending batch of 23 Sukhoi jets to the Air Force in early 2020. With no further orders in place, more than 5,000 employees of the unit will be without work. 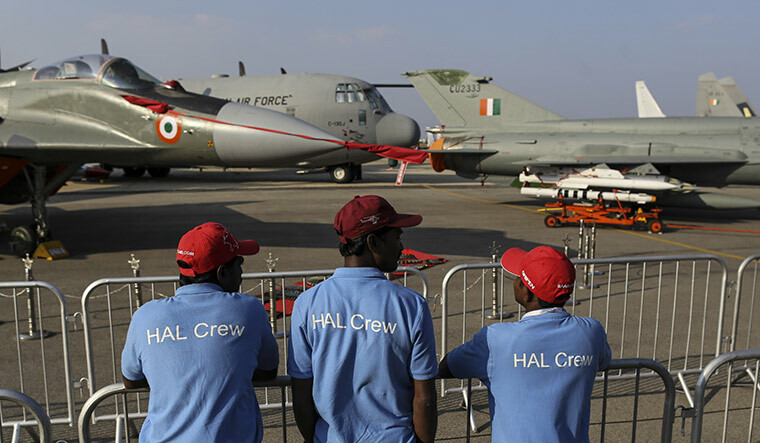 The 3,000 personnel at HAL’s Bengaluru division, too, have no orders to look forward to after they finish upgrading the Air Force’s Jaguar and Mirage aircraft. They could well be transferred to the Tejas unit, also in Bengaluru, which is building 83 light combat aircraft. The situation does not bode well for the Air Force, which depends on HAL for aircraft spares and service. The Air Force is already struggling to sustain its operational capacity—the number of fighter squadrons have come down from 42 in 2002 to 32 at present. The figure will be 28 in 2020, if the government does not take drastic measures. In Parliament and outside, the government and the opposition have been trading barbs over defence deals. In response to Rahul’s Rafale-related allegations, the government has highlighted the alleged corruption in the AgustaWestland helicopter deal, which was signed and then scrapped by the previous, Congress-led government. The arrest of Christian Michel, the alleged middleman in the deal, and his statements have helped the government attack the Congress. But Sitharaman’s spirited defence has failed to satisfy the Congress. Rahul has promised to launch a criminal inquiry into the Rafale deal if his party comes to power after the Lok Sabha elections. He also alleged that Prime Minister Narendra Modi was “running away” from the questions posed to him, including the ones related to HAL and its financial woes.